Muslims in Cork, together with Muslims around the world have been observing the holy month of Ramadan where fasting from sunrise to sunset for the period is one of the five pillars of Islam. Ramadan is observed in accordance with the lunar cycle and is expected to end on 28 July when the crescent of the new moon is sighted. 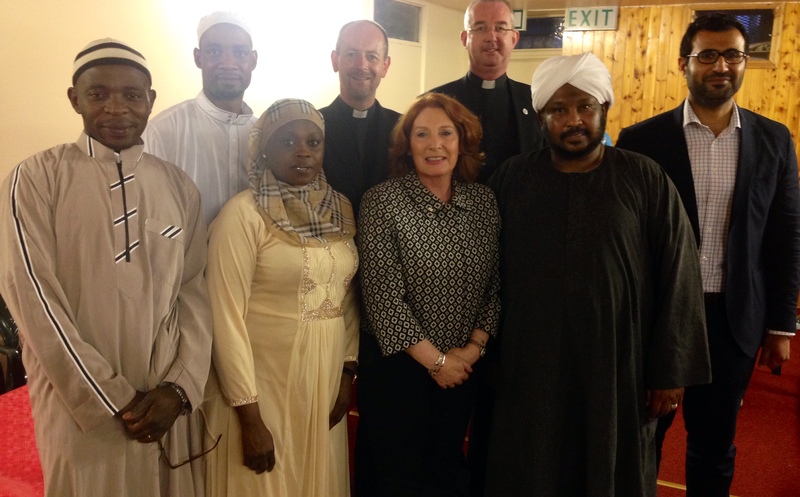 Sheikh Ihab Ahmed from the Blarney Street Mosque in Cork City extended an invitation to the Christian Community to join with the Cork Muslim Community for the Iftar إفطار‎ meal for the last Friday of Ramadan. Fr Christy Fitzgerald represented Bishop John Buckley, and Canon Daniel Nuzum represented Bishop Paul Colton. They were also joined by Lord Mayor of Cork, Cllr Mary Shields, Ms Kathleen Lynch TD, Minister of State, and Mr Mohammed Alshamsi, Deputy Head of Mission from the Embassy of the United Arab Emirates in Dublin. Following a shared meal together the guests were received in the Mosque Prayer Room and warmly welcomed by the assembled congregation as they gathered for prayer. This invitation is a further deepening of the warm relationship between our faith communities in Cork City and builds on the work of our Cork Muslim-Christian dialogue and the publication of A Journey Together by Cois Tine in 2013. It was an honour to attend this celebration. This entry was posted in Church in Society, Church of Ireland, Diocese, Interfaith Dialogue. Bookmark the permalink.